How did you find KB? I actually found KB through my sister Courtney, who is also a KB Kickboxing instructor. Courtney was in NY doing an internship and started taking Dasha’s classes and then got certified for Kettlebell Kickboxing in the very first session they offered. I had just had my 3rd baby and tried one of Courtney’s classes and was instantly hooked. I then decided to get certified myself. I initially mentored Courtney and then corresponded back and forth with Dasha via email and online to start my certification but then I completed my certification by going to NY to get live, hands on experience with Dasha and her crew!! What an awesome experience to meet and train with the ladies on the DVDs!! How did you make the decision to do KBIA? I have always been involved in the fitness industry personally and professionally but after becoming a mother a decided to stay at home with my children. Teaching classes helped me stay in shape, motivated, and provided me with enough “me” time that I am a better mother and wife to my family. How has your teaching changed, been enhanced? perspective changed? In my past I was hooked on cardio workouts. I would run at a steady pace everyday for an hour and be done. Since incorporating Kettlebell Kickboxing into my exercise routine I quickly learned that there are much better more effective ways to workout than strictly doing cardio routines. 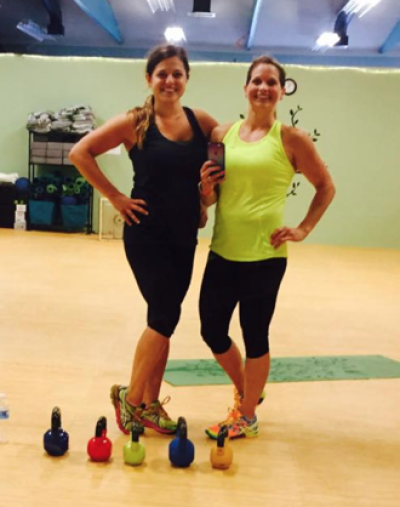 My students LOVE Kettlebell Kickboxing and classes continue to grow! It is so inspiring watching others take control of their lives and become healthier, stronger, and happier. 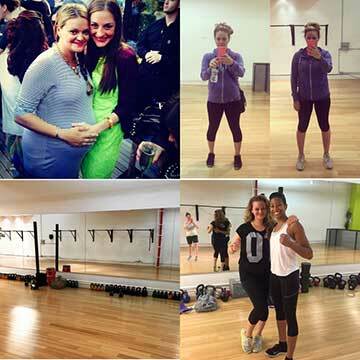 Tell us about your class – where it is, what its like running your studio. 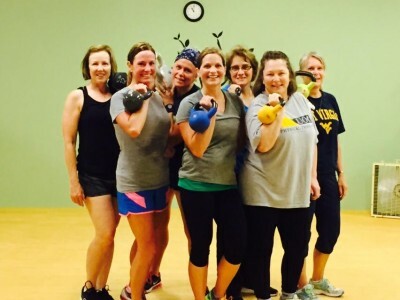 I have been teaching Kettlebell Kickboxing classes at The Hollidaysburg Area YMCA for the past 3 1/2 years. I have just recently stopped doing scheduled classes at the YMCA and I am doing more private sessions. What Inspires You To Train? I have always been very active and trained for as long as I can remember. I feel better when I take care of my body through exercise and eating healthy. I always say the more you exercise the more you will want to exercise. It becomes a habit that you can’t go without! What Inspires You To Teach? I love teaching and sharing my knowledge with students. 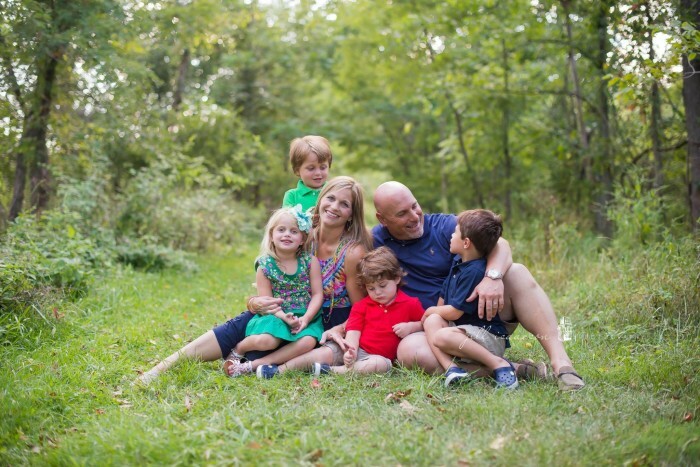 After my husband and I were married we quickly started a family and I had 4 babies in 4 years. I was and am still determined to take care of my body and not use having children as an excuse to be out of shape. What Is Your Favorite KB Move? I have so many favorite moves in KB it’s hard to pick just one. The swing is always a go to….but any move that involves squatting, pressing, and kicking. The crescent squat/crescent kick is a great one!! How Did You Find Fitness? Fitness has always been a part of my life, even as a child I would do exercise videos with my mom. I remember watching her sweat as she worked out and think how great that was and how I wanted to sweat like that!! (Haha) I get wish every time I do KB! What Is Your Single Most Defining Factor In Training? I think it’s great when you see students growing stronger and more confident. I have several students that show up and I can really tell they are pushing themselves hard, which makes me push myself harder. It’s great when you can motivate each other and push yourself out of your comfort zone and accomplish things you didn’t think were possible. What Was Your Biggest Hurdle In Fitness/ Health? And How Did You Get Over It? There are always newer and trendier fitness fades coming out. I think you just have to stick to what you are passionate about. I personally feel like Kettlebell Kickboxing has stood the test of time and classes are still in demand. Whats On Your Play List In KB Class? I love anything upbeat! Music sets the tone of the class, so great tunes are a must!! Whats Your Go To Fitness Style? My fitness style is usually black Capri leggings, with brighter tops, tanks, and sports bra. Great shoes are a must!! One Move/ Exercise You Love To Have? I love the leaping leopard with a kick thur!! Something about that move makes me feel strong! How Have Kettlebells Transformed Your Body, And Your Fitness Perspective? I am currently doing private sessions. Why Should I Try Your Class? If you haven’t tried Kettlebell Kickboxing you must!! There is really no other class like it!! You will get the best workout for your body in one of my classes. Why put in an hour of time exercising if you don’t want to get the results. Kettlebell Kickboxing will give you results!! If you plan on exercising and moving your body do it in a way that is the most effective!! 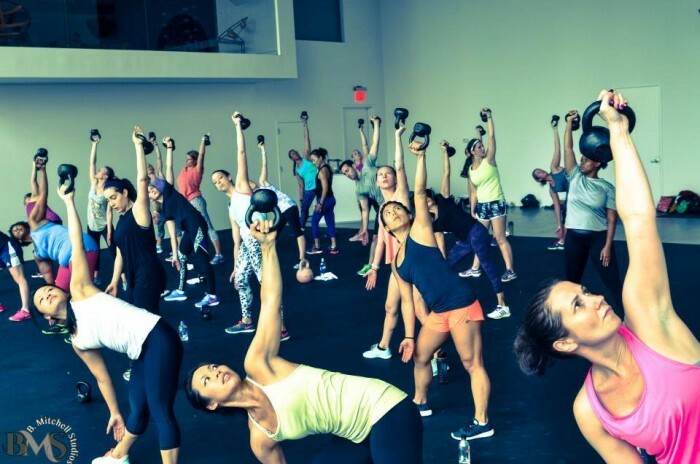 Kettlebell Kickboxing is a total body workout like no other! Thinking of teaching? Bringing Kettlebell Kickboxing to your city or home town?